Food allergies are common and will affect nearly everyone at some point in their life. These include fruits, some of which have a high propensity for oral allergy syndrome (OAS), a cross-reaction between certain pollens and fruits that body recognizes as being the same. 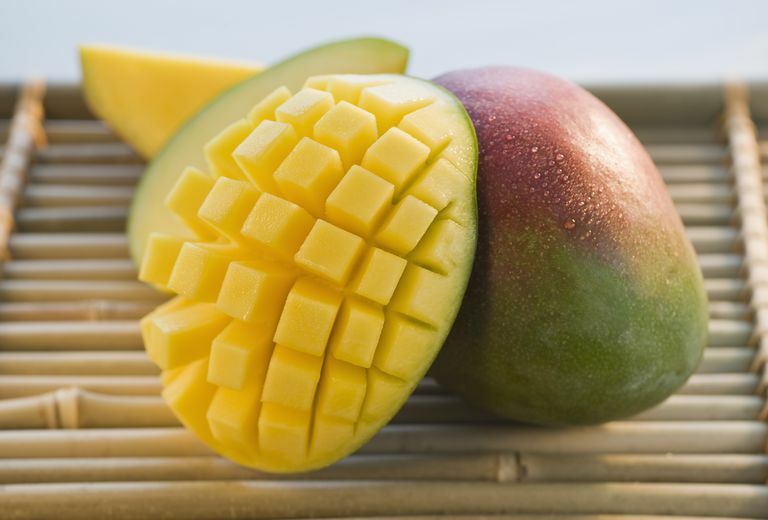 The one fruit that stands apart in its ability to cause an allergy is the mango (Mangifera indica). As the national fruit of India, Pakistan, and the Philippines, the mango is grown on a tree that belongs to the cashew family Anacardiaceae. This is the same family of plants which include poison oak, poison sumac, and poison ivy. This distinction can not only make eating mango problematic for some people, it can sometimes be downright dangerous. Oral allergy syndrome (OAS) is typically an uncomplicated allergy that occurs almost immediately after eating a piece of fresh fruit and usually resolves without treatment within minutes. OAS occurs as a result of similarities in the proteins found in mangoes and pollens (most often birch pollen or mugwort pollen). Strangely enough, having a latex allergy can also cause OAS symptoms when eating mango, a condition referred to as latex-fruit syndrome. The diagnosis of OAS is typically made with skin testing to confirm whether there is a cross-reaction between mango and commonly associated allergens. OAS is usually not considered a serious condition as the saliva in a person’s mouth is usually able to break down the allergen quite quickly. As such, any response is usually limited to the mouth and/or lips. However, due to the relatively small risk of a more serious reaction, people with a mango allergy are advised to avoid all raw forms of the fruit. Cooked fruit rarely poses a problem. Another type of reaction that can occur as a result of eating mango is something called contact dermatitis, This is due specifically to a substance found in plants of the Anacardiaceae family called urushiol. Urushiol is the substance that causes rashes from poison ivy, poison oak, and poison sumac. In mango, urushiol is found in high concentrations in the peel and the fruit just beneath the peel. In most people, contact with urushiol will induce an allergic skin response. With mango, the allergy may not be as common as, say, poison oak or poison ivy but, in some cases, it can be just as profound. This reaction, which resembles a poison oak rash, most often occurs on the face within hours of eating the fruit and can last for several days. The rash will appear as small, itchy blisters that can sometimes ooze. While this type of mango allergy isn’t especially dangerous or life-threatening, it can be uncomfortable and annoying. Treatment, when needed, will involve a topical or oral corticosteroid, depending on the severity of symptoms. The diagnosis can be made based on the appearance of the rash. Testing is usually not required. If the reaction is especially severe, patch testing may be used to confirm whether mango is, in fact, the cause of the rash. In some cases, the person’s condition can rapidly deteriorate and lead to coma, shock, cardiac or respiratory arrest, and even death. Emergency care should be sought, without exception, if a person experiences a sudden, severe reaction to mango. Persons who have experienced severe allergic symptoms after eating cashew or pistachios should also avoid mango due to potential cross-reactivity. Those at risk of anaphylaxis should always carry injectable epinephrine (such as the EpiPen) in the event of an accidental exposure to mango or any cross-reactive substance. Sareen R. and Shah, A. "Hypersensitivity Manifestations to the Fruit Mango." Asia Pac Allergy. 2011; 1:43-9. DOI: 10.5415/apallergy.2011.1.1.43.